The very first Tchaikovsky Competition took place in 1958 with categories for piano and violin. It now takes place every four years and includes categories for cello and voice. In this gallery we take a look back through the amazing history of this world-famous competition. 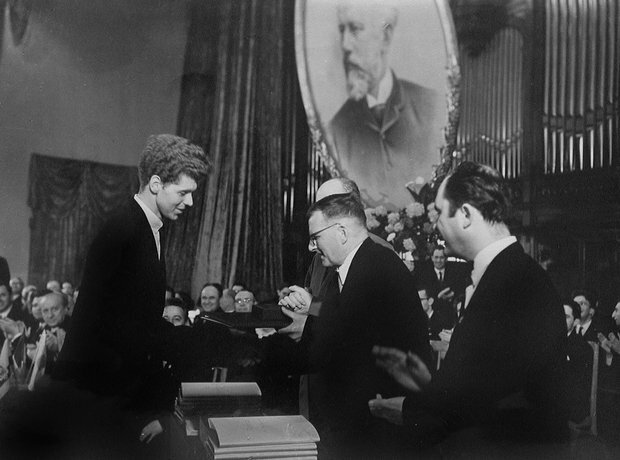 Shostakovich presents pianist Van Cliburn with the gold medal in 1958. The jury had to get permission from Khrushchev before giving first prize to an American. On the phone Khrushchev asked "Is he the best?" and when the jury member assured the politician that Van Cliburn was indeed the best, Khrushchev replied "then give him the prize". Violinist Valery Klimov (left) with pianist Van Cliburn – they both won their respective categories in 1958. The winner of the inaugural competition, Van Cliburn, performs to a packed hall. The piano competition's very first winner was Van Cliburn, in 1958. He's pictured here with fellow pianist Emil Gilels. Pianist John Ogden (second from right) pictured with pianist Vladimir Ashkenazy (second from left) and (centre), Khrushchev at the Competition in 1962. Ogden and Ashkenazy were awarded joint first prize. Three great pianists relax at the Tchaikovsky Competition: Emil Gilels, Grigory Sokolov and Misha Dichter. Pianist Vladimir Ashkenazy performs at the competition in 1962. Pianist Mikhail Pletnev was crowned winner in 1978. Gidon Kremer, winner of the 1970 violin competition, performs during the rounds. Violinist Ilya Kaler performing in 1986 – the year in which he and Raphaël Oleg shared first prize. Daniil Trifonov performs at the 2011 Competition – which he went on to win.